Lars Krutak received his Ph.D. at Arizona State University’s School of Human Evolution & Social Change in 2009. Since 2003, he has been studying the socioeconomic impacts of tourism and tourism promotion on indigenous Rarámuri (Tarahumara) arts and crafts vendors living in the Copper Canyon region of Mexico for his dissertation. Krutak began tattoo research in 1996 as a graduate student at the University of Alaska Fairbanks. Trained as an archaeologist and cultural anthropologist, he spent three years exploring the complex symbolism and practice of tattooing throughout the Arctic. Krutak’s tattoo research culminated in an unpublished Master’s thesis, One Stitch at a Time: Ivalu and Sivuqaq Tattoo, focusing on the traditional tattooing of the St. Lawrence Island Yupiit, as well as several freelance photojournalism jobs for leading tattoo magazines in Germany, England, and the United States for which Krutak continues to write. Today, Krutak also contributes articles to other international tattoo publications, including Total Tattoo (UK), Tattoo Savage (USA), Z Tattoo (Denmark), Tattoo Magazin (Hungary), and Tattoo Planet (Netherlands). Krutak worked for several years as a Repatriation Research Specialist at the National Museum of the American Indian, an Archaeologist in the Repatriation Office of the National Museum of Natural History, and today he is a Program Specialist at the Indian Arts and Crafts Board, an agency in the U.S. Department of the Interior. Between 1998 and 2003, he worked in several countries of the former Yugoslavia monitoring democratic reforms and elections for the OSCE. Lars also serves as a volunteer manuscript reviewer for these leading academic journals: Journal of Material Culture, Current Anthropology, Journal of Cultural Heritage, Études/Inuit/Studies and Ethnohistory. He is very active in the field of museum curation. In 2002, Krutak embarked on a world tour devoted to recording the lives, stories, and experiences of tattooed people around the globe. He has worked as an Anthropological Consultant for three National Geographic television documentaries, and is the Technical Advisor for one of the world’s largest and most popular tattoo websites, www.vanishingtattoo.com. In 2003, he was a co-recipient of the American Book Award in Literature. Look for Lars in the Discovery Channel (USA), Discovery World (Europe), and Discovery Travel & Living (Australia & New Zealand) series “Tattoo Hunter” focusing on indigenous body modification practices worldwide. Also look for Lars’ published works on Native North American tattoo in “Drawing With Great Needles: Ancient Tattoo Traditions of North America” (University of Texas Press, November 2013). 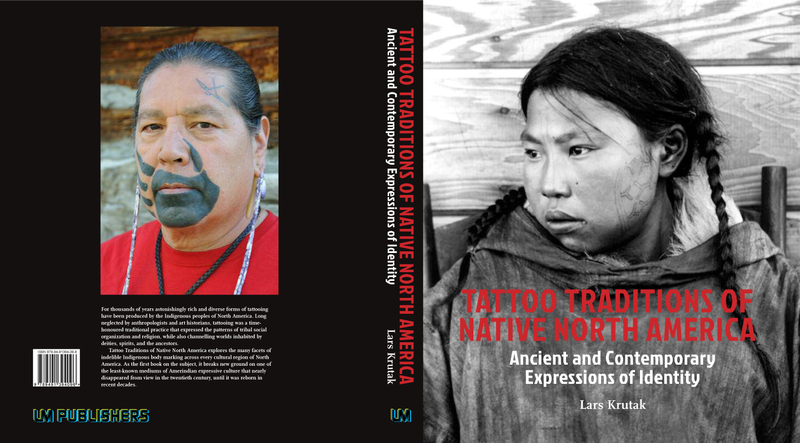 In June 2014, Krutak’s new book Tattoo Traditions of Native North America: Ancient and Contemporary Expressions of Identity (LM Publishers/University of Washington Press, 256pp.) was published and focuses on the Indigenous tattoo history of the entire North American continent. Books also available on AMAZON.com. “For thousands of years astonishingly rich and diverse forms of tattooing have been produced by the Indigenous peoples of North America. Long neglected by anthropologists and art historians, tattooing was a time-honored traditional practice that expressed the patterns of tribal social organization and religion, while also channeling worlds inhabited by deities, spirits, and the ancestors. Krutak also served as the senior edited for the 2017-18 release ANCIENT INK: THE ARCHAEOLOGY OF TATTOOING published by the University of Washington Press. ANCIENT INK is the first book dedicated to the archaeological study of tattooing, presents new research from across the globe examining tattooed human remains, tattoo tools, and ancient art. It contributes to our understanding of the antiquity, durability, and significance of tattooing and human body decoration and illuminates how different societies have used their skin to construct their identities. ANCIENT INK connects ancient body art traditions to modern culture through Indigenous communities and the work of contemporary tattoo artists.